The use of largely Victorian technology and equipment at Caledonian means that by necessity the beers brewed here can truly be described as being hand-crafted. The beers are traditionally brewed using malt, water, hops and yeast. The only occasional additives are natural flavourings such as liquorice, ginger, and orange peel. The brewing process starts with malt supplied by Simpsons, a local family-owned maltster that’s three years older than the brewery itself. The malt, mainly malted barley, comes from the east coast of the UK, from East Lothian down to East Anglia. Different varieties of malt contribute different flavours and the brewers select proportions of different malts according to specific recipes. Pale and Golden Promise are used in Deuchars IPA, while the more complex Caledonian 80/- has Pale, Crystal, Golden Promise, Amber, Black and malted wheat. How long and how hard the malt is roasted will also change its colour and flavour. Pale light malts have a biscuity Ovaltine-like smell. Roast for a bit longer and the colour darkens and the flavour becomes more toasty. Heavily roasted dark malts have burnt toast-like flavours with dark chocolate, coffee and toffee. The malt is sucked up to the very top of the building where it goes through a de-stoner to remove any impurities. It then passes through a four-roll mill in the most modern part of the brew house, built in 1987. The grist mill cracks open the husks of barley rather than grinding them into a fine powder, creating a course flour called grist. Importantly this contains the husks which add colour, body and flavour to the finished beer. The grist is now ready to release its flavour and for its starch to be converted into fermentable sugars and this conversion takes place in Caledonian’s two mash tuns which hold three and five tonnes of malted barley respectively. These are very small mash tuns but it’s worth remembering that each tonne of barley will yield around 20,000 pints of beer. Brewers call the water used in the mash tuns ‘brewing liquor’ and this is mixed with the grist in a chute called a Steele’s Masher. This is essentially an auger that sits over the mash tun delivering a porridge-like mixture to build an even bed below in the mash tun. The Steele’s Masher at Caledonian was only replaced in 2014 and the old copper belt driven masher lies on the floor next door looking like an antique torpedo. The new stainless steel masher looks modern in comparison but there is only one other like it and that’s in the Bass Brewing Museum. 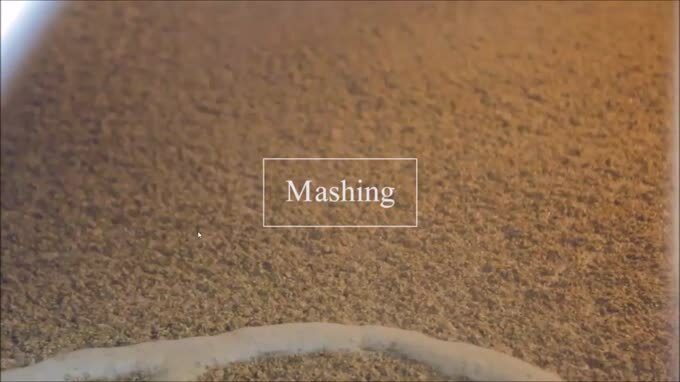 It takes a skilled and experienced operator to continuously manually adjust the rate water and malt churns through the Steele’s Masher to deliver the required porridge-like consistency at the correct temperature (63-65°C) into the mash tun. The mixture is left for 60–90 minutes to allow the heat and natural enzymes within the malt to convert the grain’s starch into sugars. Then for the next three to four hours the sweet bed of porridge will slowly drain whilst being continuously sprayed with hot water to increase the temperature to (63–65°) and wash out any remaining sugars in a process known as sparging. The hot sweet brown liquid drained from the mash tuns is called wort and this is used to fill the copper kettles in the Brew House for the next part of the brewing process. Cleverly this Victorian brewery was designed to harness gravity so pumps aren’t necessary. The spent grist is sent to local farmers for use as animal feed. The Brew House at Caledonian dates back to 1869 and it is famous for its three antique direct-fired copper kettles. Although brewers still talk about kettles as being “coppers”, this has become something of a generic term, akin to Hoovers and vacuum cleaners, and most are now made of stainless steel. Some old copper kettles still sit unused like museum pieces in other breweries but the three at Caledonian are probably the last three direct fired coppers used every day anywhere in Europe. These kettles were originally heated by burning coal directly underneath with coal continuously shoved from the coal bunker to keep the fire burning. They are still directly heated but the flames are now gas fuelled. Copper is perfect for conducting heat and the shape of the kettles is very traditional. In the centre hangs a device called a Chinaman’s Hat that the brewers can lower or raise to control the rate of boil. As the wort boils steam is captured by the copper hoods over each kettle and rises to be vented from the pagoda topped chimneys in the roof above. There’s no extraction fan or steam in the room, Victorian ingenuity ensures the steam is naturally extracted. The sweet wort is heated to 104°C and boils in the cauldron like copper kettles for about an hour. Because of the shape of the copper the boiling wort stirs itself, so as the first load of hops are tipped in to add bitterness they distribute and combine easily and evenly. The boiling adds a desirable soft caramelisation and extracts bitterness from the hops. Towards the end of the boil more hops may be added, sometimes of a different variety, to add aroma rather than bitterness. Victorian forethought is also evident at the top of the building in the hop store. This room is very well insulated but is also vented from the north, so providing natural air conditioning. When the temperature rises the brewers simply open a vent to cool the room so keeping the hops at an even temperature. Caledonian use the best ingredients possible and this includes only using full leaf hops rather than pellets, powder, oils or extracts. 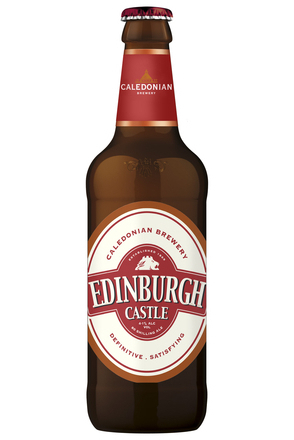 Caledonian use around 45 different hop varieties from all over the world – from traditional Kent bittering hops to citrusy American hops. Until recently the dried hop flowers arrived at the brewery in traditional hessian sacks but after trials in 2014 the brewery moved to what are known as fresh pack hops, vacuum packed half bricks of hops, to preserve the essential hop oils. If you rub the hops together in your hands you’ll feel the stickiness of their oils. As one copper kettle cools so the next is filling while the third may be boiling. It’s not by chance that the Victorians installed three kettles. The wort is moved to the Hop Back, a vessel that separates the boiled hops from the wort. The spent hops are recycled into compost. Next the still hot wort moves to a heat exchanger called a Paraflow. Here cold brewing liquor (water) is used to cool the hot wort, in turn pre-heating the liquor for use in mash tuns. The cooled wort goes to the fermenting vessels where yeast is added. All of the ales are brewed in 17 very traditional open square fermenting vessels, each holding 185 brewers’ barrels (53,000 pints). Here the yeast starts to consume the sugars in the sweet wort and as a result produces alcohol, carbon dioxide and heat. Happy in its sugar rich environment the yeast also multiplies. Colling pipes in one of the 17 open fermentation vessels. Water is pumped through heat exchange pipes in each fermentation vessel to maintain a temperature between 17 and 22°. High levels of carbon dioxide in the atmosphere are kept in check by continual ventilation and monitoring devices linked to an alarm warn the brewers if dangerous levels are reached. As the yeast consumes the sugars, the wort bubbles with the carbon dioxide produced. Checking the gravity of the fermenting beer. The gravity of the beer is checked ever four hours to ensure the level is falling according to the recipe and that the fermentation is progressing according to profile for that beer. The cooling pipes are used to control the temperature and influence yeast activity. Recovering yeast by vacuuming yeast off the surface of the beer. The yeast multiplies to such an extent that it is vacuumed off the surface to be re-propagated and recycled. Some of Caledonian’s yeast is sent to Japan for use by the whisky industry there. Nothing at Caledonian goes to waste, everything is recycled and reused. Towards the end of fermentation a kind of brain pattern forms in the froth on top of the beer and this shows the brewers that the yeast is now having to hunt for remaining sugars. Finally the spent yeast stops producing alcohol and carbon dioxide and so starts to collapse, causing the level of beer inside the fermenter to fall. The beer is left in the fermentation tanks for about four, five or even six days to mature depending on the style of beer and how quickly it’s fermenting. This allows sediment to fall and settle on the bottom. The brain-like pattern remains on the surface of maturing beer with tram lines also visible, reflecting the cooling pipes in each fermenter. This long maturation period makes the finished beer fuller and more complex. Finally the beer is clarified and racked it into casks. Even in the casks, the beer still has some yeast present allowing secondary fermentation to take place in the pub so giving the beer a natural effervescence. The process described above for brewing ale has remained unchanged since Victorian times but while Caledonian is the most traditional of breweries it is also forward thinking. Caledonian not only boasts a state-of-the-art pilot brewery, it also has seven modern vertical conical fermenting tanks, housed in one of the few modern buildings on the site. Lagers such as Caledonian’s Three Hop lager are made in exactly the same way as the ales, including the use of the Victorian copper kettles, up to the point of fermentation. Lager is brewed with a different kind of yeast. Fermentation is slower because it’s colder and this allows crisp flavours to develop in the lager. The lager is matured in these conical vessels for anything up to three weeks. Caledonian is a small brewery but it is incredibly self-sufficient with the facilities needed to produce cask beer, including filtering and kegging. The only thing they don’t do at Caledonian is can or bottle beer. Presently bottle and canned beers only account for 12% of Caledonian’s output while 60% is traditional ale distributed to pubs in cask and 28% by keg.